Learn basic Skills for Screen, Direct-To-Garment and Dye-Sublimation Printing! 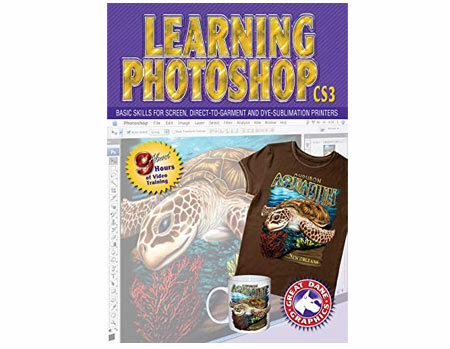 Learning Photoshop CS3 is a DVD-ROM loaded with tutorial movies. Geared specifically for screen printers, direct-to-garment printers and dye-sublimation printers. This DVD takes you through everything you need to know to get you started. From how to initially set up the application and your workspace, to the tools and palettes, to basic art principles, it covers all this and more. With 8.45 hours of tutorial movies, by the time you are finished with this training DVD you will have all the basic information you will need to help you start creating artwork like you’ve never done before. As an added bonus, we include 14 original layer styles to use and enjoy when creating your designs. So don’t wait! Learn all that you need to know to start producing money making designs that will bring your customers back time and again!